Diving into the Bingara Pool will no longer knock the breath out of your lungs, thanks to a $229,834 project funded by the NSW Government that promises to keep the water at a balmy 28 degrees throughout the winter months. 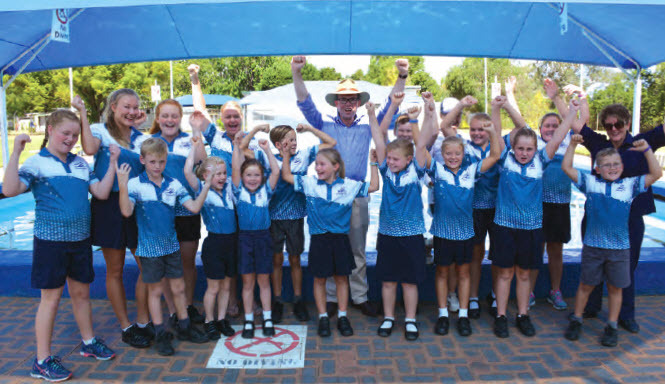 With the pool now closed for winter, Member for Northern Tablelands met with swimmers from Bingara Central School recently to announce that major upgrades would soon extend the popular facility’s operating season. Adam Marshall visited the club’s junior members to deliver the good news recently. “Bingara has produced a promising group of local swimmers, but the local pool is only just treading water,” Mr Marshall said. “The 55-year-old facility has been battling with leaks for years and the region’s frigid winters have limited usage to a five month window from mid-October to late March. “Thanks to a new solar heater and pool blanket, the water will be kept to a comfortable 28 degrees through a longer swim season, giving promising young swimmers a better opportunity to hone their aquatic skills. Funding for the project has come from the NSW Government’s Stronger Country Communities Fund, part of the $1.3 billion Regional Growth Fund dedicated to improving community amenities in rural and regional areas. Mr Marshall said that extensive works would resurface the pool to prevent further leaks, while Gwydir Shire Council also planned to convert the 33⅓ metre pool into a standard 25-metre competition format. “Council has been battling with leaks for years, yet attempts to plug the many holes have been found to be expensive and temporary,” Mr Marshall said. “A new lining will stop leaks, saving the community thousands of litres of water and driving down running costs, delivering residents a better return on their rates. Gwydir Shire Mayor John Coulton said upgrading the pool was a longstanding priority for council. “The Bingara Pool is an essential facility for the town, both of our towns are very passionate about swimming, and you need somewhere to be able to learn this vital skill,” Cr Coulton said.